The words "KILROY WAS HERE" and a simple drawing of a face peeking over a fence were written on any surface US servicemen came near during World War II, usually meant to be the mark of the first American GI to arrive at that place. Kilroy's face was so ubiquitous wherever American servicemen went, especially in Europe, that rumors popped up saying Hitler himself issued orders to find Kilroy and that Stalin came face-to-face with Kilroy inside a Potsdam outhouse. During the war [Kilroy] was employed at the Bethlehem Steel Company's Quincy shipyard, inspecting tanks, double bottoms and other parts of warships under construction. To satisfy superiors that he was performing his duties, Mr. Kilroy scribbled in yellow crayon "Kilroy was here" on inspected work. Soon the phrase began to appear in various unrelated places, and Mr. Kilroy believes the 14,000 shipyard workers who entered the armed services were responsible for its subsequent world-wide use. Some versions say JJ Kilroy's chalk markings started in order to end cheating by some riveters, but the earliest accounts from Kilroy himself have no mention of this. The ships JJ Kilroy was inspecting were being sent out before they were painted, so when sealed areas were opened for maintenance, sailors found the unexplained name scrawled. Thousands of servicemen may have potentially seen his slogan on the outgoing ships and Kilroy's omnipresence and inscrutability sparked the legend. The cartoon figure of a little man looking over a wall came from British popular culture and was known as "Mr. Chad." Mr. Chad was usually drawn with the words, "Wot? No _____?" with the blank filled in with an item in short supply, such as "Wot? No Petrol?" or "Wot? No Bread?" (Mr. Chad appeared on the side of a Horsa glider used in Operation Market Garden by the British 1st Airborne Division with the tag, "Wot, No Engines?"). Australian popular culture had a similar Mr. Foo who may trace to World War I. "Mr. Chad" was born in 1941 at a secret school in Gainsborough, Lincolnshire that was teaching "Radio-Location," now called "Radar." A lecturer was illustrating on a blackboard the effect of a capacitor in a circuit. How the drawing started is shown in the attached picture. Later, an unknown genius added the question mark and the now immortal words "WOT! No Electrons?" (all of them having been discharged, of course). Once "KILROY WAS HERE" and the image of Mr. Chad were joined together, they made their way to every corner of the American presence, especially in newly captured areas or landings. Navy UDT divers landing on Japanese held islands in advance of Allied landings even reported finding "KILROY WAS HERE" on Japanese pillboxes. 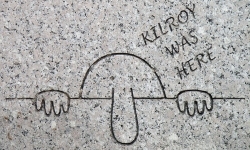 Kilroy was so much a part of the American war experience that in 2004 he even found his place on the US National World War II Memorial in Washington, DC. Sources: Wikipedia; BBC Peoples War; World Wide Words; B-26 Marauder Historical Society; The Legends of "Kilroy Was Here". Interesting info. Great reading. "Art" was here! that was cool. "rick was here"
Supercool. I'm going to start carrying a sharpie around- but no defacing monuments! I might change the name to 'Killjoy' though- he also needs a knife in his teeth. My utmost respect for fallen comrades through the years on this day in their honor. Memorial Day 2015 Ripley was here. It was not uncommon to see "Kilroy was here" sketch # 1 on our Naval drawings being built for our nuclear submarine fleet in the 1960s'.